Headache, commonly known as headache, is a very common disorder in our society and a highly variable intensity, not only from an objective viewpoint, but subjective. Is a disorder, which sometimes manifests mild and timely, while in other cases it can completely cronificar. It affects middle-aged, although studies indicate that women tend to have a higher incidence. Statistics indicate that approximately 5% of the population suffers from headaches in a more or less continuous and rare is the individual who has suffered throughout his life. There are many varieties of headache and each has particular characteristics somewhat in terms of the radiation zone, process duration and frequency that manifests, and if we add the patient's subjectivity in terms of pain intensity, is somewhat difficult to determine which is the most intense headache or more painful. 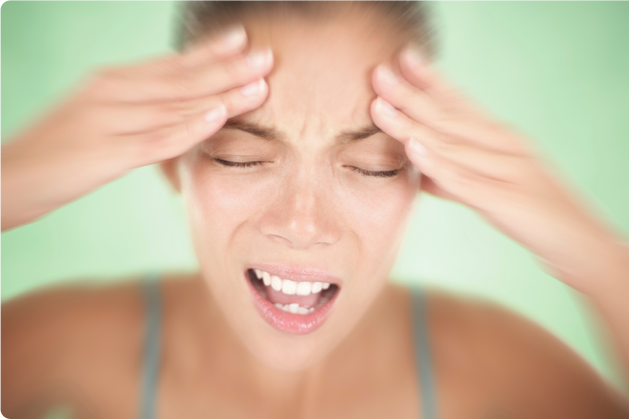 It is therefore important to analyze each type of headache, analyzing the characteristics of pain, the affected area, duration, frequency, situations in which it manifests and other symptoms associated with the headache, in order to rule out other pathology and to discern the type of pain and the best treatment for each case. Now, from the point of view of Traditional Chinese Medicine, such painful conditions often occur as a result of the condition of various pathogenic factors. The two aspects can be summarized, the external type, that correspond to the elements and the internal type, where emotions play a very important. Headaches due to external character etiologies, are produced, as indicated, as a result of the condition of the external pathogenic factors, which are wind, cold, heat, moisture. Wind being the most important factor of all, since it is carrying the rest, opens the door to penetrate the other factors that transports, is therefore known as "head of the pathogenic factors". When there is an attack of these pathogenic factors, changes occur in the flow of power and therefore also of the blood, and these blocks are responsible for the manifestations of pain are so annoying. Headaches due to internal etiologies, are produced as a result on the one hand by the lack of nutritional supply from other organs to the brain, manifesting as pain, as a warning system of this irregularity. Emotional disturbances can also alter the energy flow toward the head, providing a perverse energy that disrupts the normal functioning and is manifested as pain, also as a warning system that alteration. There is also another set of internal factors such as food irregularity can lead to a lack of nutrition of the brain, either, an accumulation of pathogens, for lack of metabolism of these and they affect the proper functioning and nutrition of the same, so it can also manifest as headache. On the other hand, excessive fatigue and physical and mental exhaustion, can lead to irregular energy relationship between various organs leading to situations headache, turn, as alarm mechanism such irregularities. Traditional Chinese medicine is based on determining the type of headache, by aetiology, as the cause responsible and acts, not only trying to eradicate pain symptoms, but also the cause, the pathogenic factor responsible for this situation. In Traditional Chinese Medicine, besides acupuncture pressure can be used in certain acupuncture points that improve energy and blood circulation, avoiding blockages, tension and pain. For this reason, massage is usually a pleasant and analgesic technique while, not only by the relaxant activity, tranquilizer and sedative played but also by the resulting energy improvement. Point Yintang, Located in the center of the ends of the eyebrows, in the center of the eyebrows called, whose main functions include wind dispersal and sedation and analgesia. Being very suitable in cases of common headaches. Another interesting point is Taiyang, also corresponds to an extra point, located in the depression that is located near the midpoint between the end of the eyebrow and the outer corner of the eye. It is characterized by wind action dispersants and dispersion actions Yang tranquilizers perverse. There you go massaging and pressing the point following the Gallbladder Meridian, to the point Fengchi, known acupuncture point numbering VB.20, localized depression located on both sides of the neck, under the occipital, between the upper end of the sternocleidomastoid muscle, and the upper trapezius, above the posterior hairline. Whose main functions are to relax the muscles, descending and sedating liver yang, calming the spirit. Also a big wind dispersant etiology both internally and externally. As far as its use is indicated in cases of headache due to external wind and internal, with accumulation of liver Yang. Although this is a dangerous insertion point, and therefore of use in well-trained specialists, not reverse any fuss when used under the technique of acupressure or digitupuntura. Another point of great interest also in cases of common headaches, is the point of Bladder, V.10, Conocido con el nombre de Tianzhu, situado and cun medio en la parte de la línea interior posterior del cabello, donde el Meridian divide en dos Líneas, una and circula 1.5 cun lateralmente a la línea de la media espalda y la otra and 3 cun. Sus funciones más características son desbloquear meridianos tranquilizar y la mente y Sedar, traduciéndose esto en acciones analgésicas, por lo que su uso en cefaleas está muy expandido. Tambien existential shock posibilidades de Tratamiento, en este caso con Fitoterapia, and always taking into account, not only the property but also symptomatic etiology, the pathogenic factor responsible for this situation, so you not only have to treat the symptoms by reducing the minimum pain but also invaluable disperse and eliminate the pathogenic factor responsible, thus performs, addition to symptomatic treatment etiological treatment. The most common plants used in these cases are for example Mint and Cinnamon, common plants and decongestants features on the one hand and on the other stimulant and energy circulation, which gives relief by dispersing energy blockages often occur at the meridians, impeding their smooth circulation. Besides dispersing activity of external pathogenic factors such cold wind. Also indicate that these two plants confer significant analgesic actions, hence its activity against common headaches. There is also a plant, in this case more Asian, Ligusticum chianxiong, which are used rhizomes. Ligusticum chianxiong presents blood circulatory activities, giving on the one hand circulatory activity blockade dispersing any blood that may have occurred, as a result of wind pathogenic factor involvement, thereby also is capable of dispersing the same pathogen factor. There is also a very effective formulation in these cases of common headaches, mainly due to these external etiologies, Chuan Xiong Cha Tiao San, remain the major formulation plant, precisely Ligusticum chuanxiong, so that all its activities are related to the main floor. You can refer to another formulation, very effective in cases of internal etiologies, mainly due to changes in the emotions that causes a blockage liver Yang a perverse generation rises and affects the head, manifesting as headache, so that the formulation is intended to reduce and disperse the perverse Yang, giving analgesic actions and thus reducing headaches because of these etiologies. The formulation in question is Tian Ma Gou Teng Yin, being one of the main ingredients of cat's claw, characterized by analgesic actions and major tranquilizers, circulatory and energy improvements.